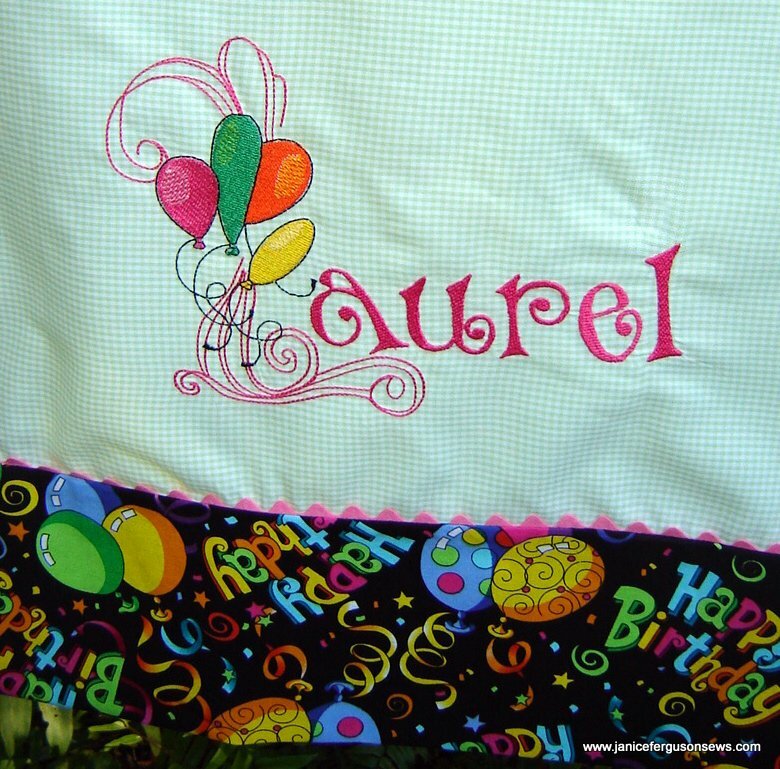 The “L” font is Loralie’s Loralesque, with balloons substituted for the floral element. The plan was to provide pigma pens for the girls to write messages on the pillow slips, much like the old fashioned autograph books from my era. But it was decided that the pillowcases were just too pretty to write on. Ahhhhh…..
Ava’s yellow broadcloth was trimmed with green rick rack. 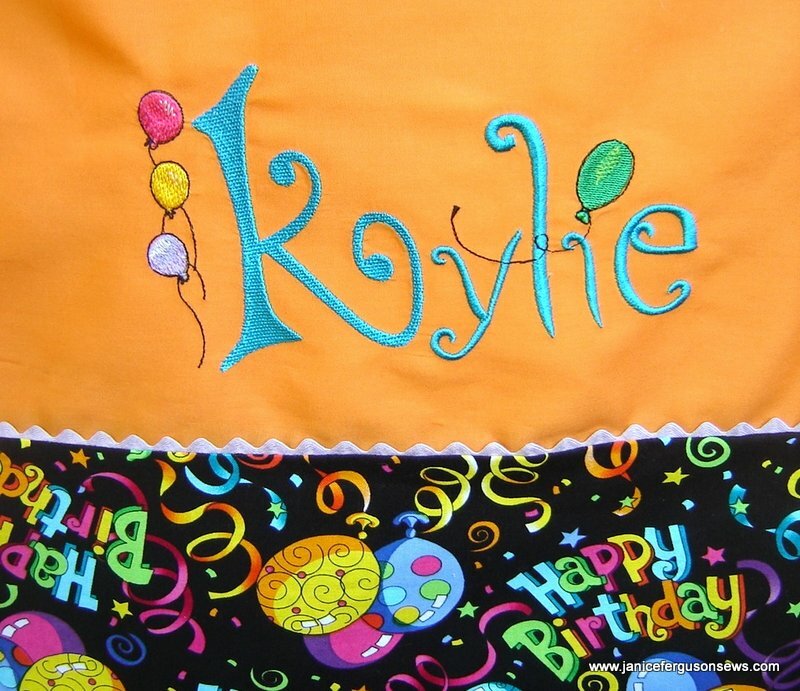 The quick and easy turn tube hem method was used to apply the Happy Birthday fabric. I just love this technique. 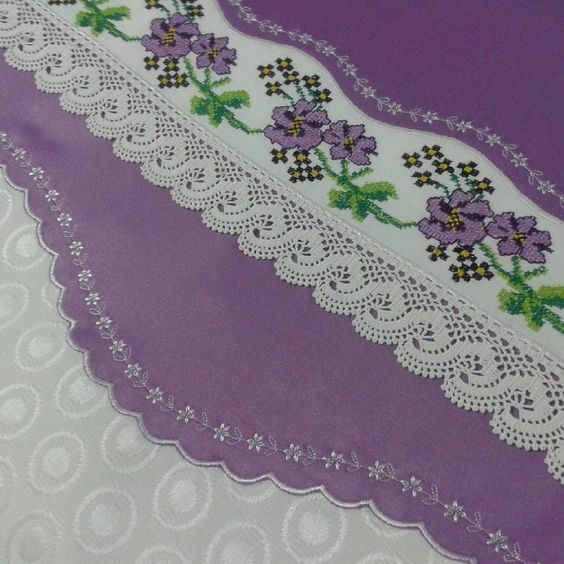 Alyssa got the lavender broadcloth with yellow rick rack. I love different fonts and really enjoyed using so many for the names. My favorites are those collections which offer several size options in both upper and lower case. In many font collections, the letters A, L, J, S, and T are not easily recognized. Orange broadcloth with lavender rick rack was for Kylie. Editing the designs to include the balloons was another part of this project that I enjoyed. 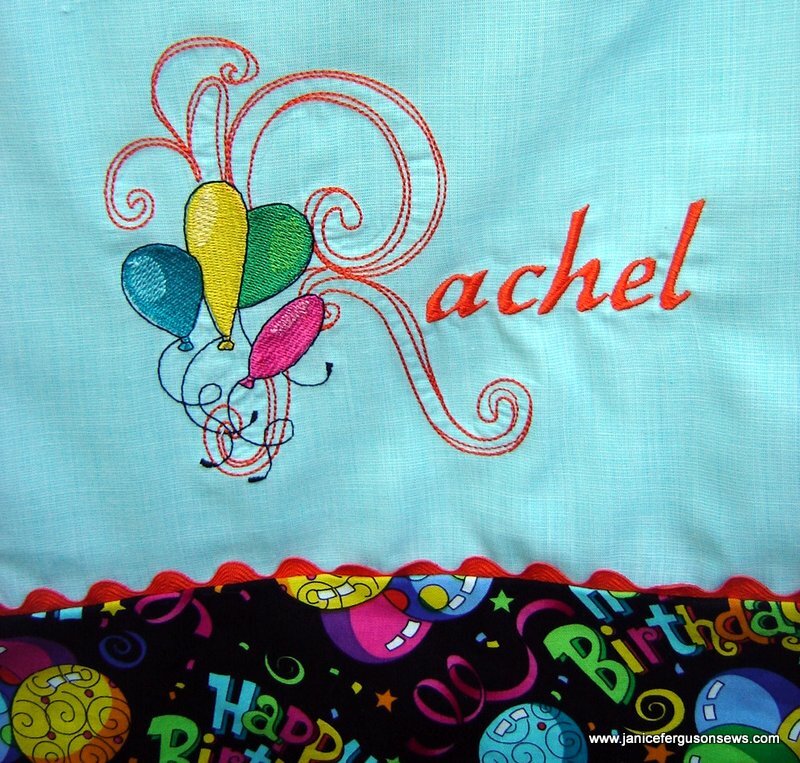 Like Laurel’s embroidery, the “R” for Rachel is from Loralesque by Loralie. This is end-on-end fabric. What a mess of puckers! These pillowcases were nice stash-busters. I need more projects like that! I love the Lulu font from Martha Pullen, used for Regan’s “R”. 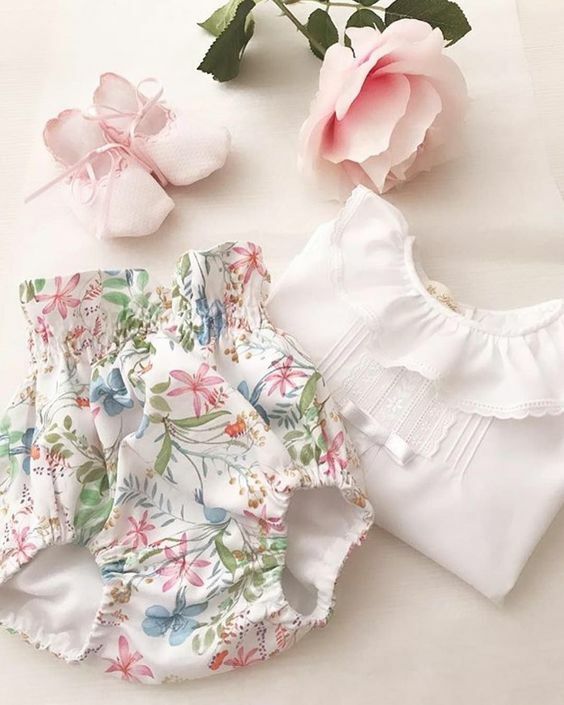 Her fabric is pastel pink broadcloth. 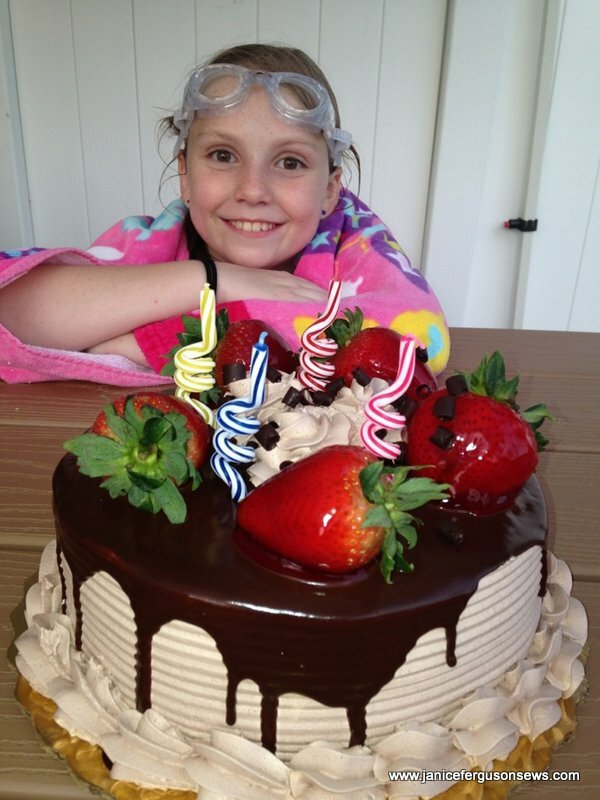 Laurel has been looking forward to her 10th birthday for a long time. Somehow, crossing into the double-digit age range was a very big deal for her. I’m so happy that I could participate by sewing these pillowcases for her big event. 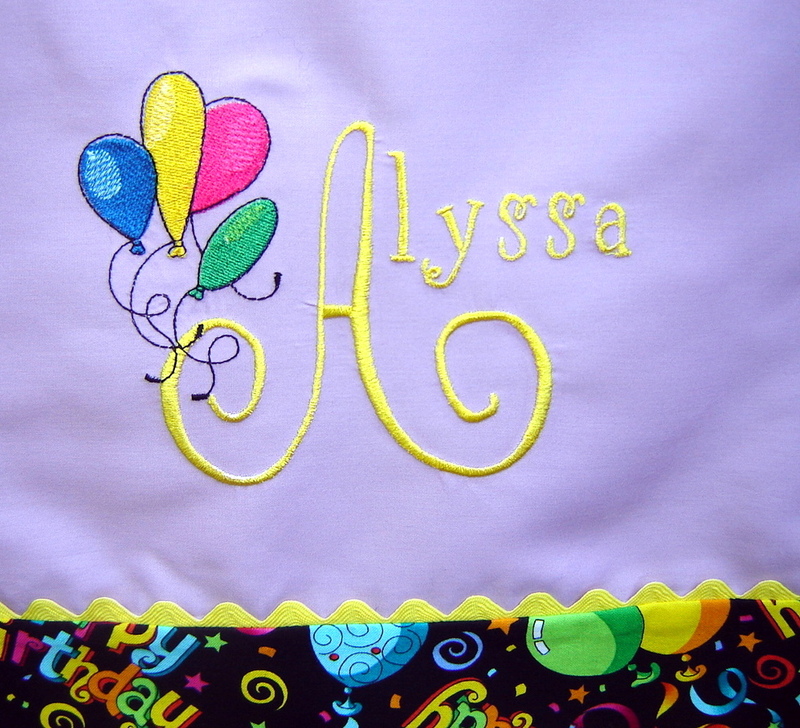 Have you all stitched party favors–for birthdays, showers, family reunions or whatever? I’d love to hear about it. 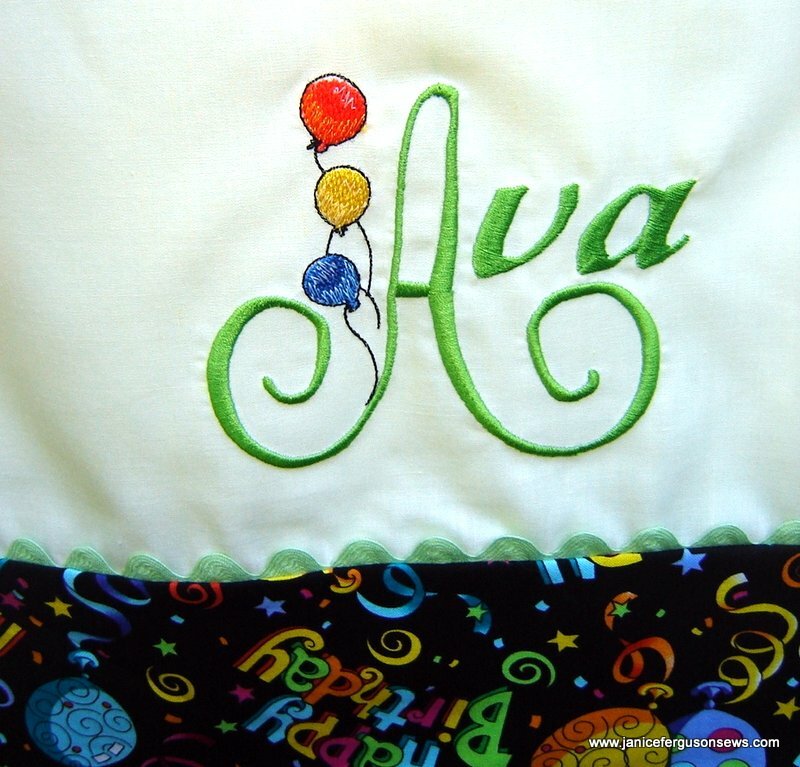 This entry was posted in machine embroidery, party accessories and ideas and tagged birthday party, machine embroidered monogram, machine embroidery, magic pillowcase hem, pillowcases, slumber party favors, turn tube hem. Bookmark the permalink. How fun for you dgd! I bet she was so proud to have such unique and personal party favors. Love all of them, they look like so much fun! Good Grandma for making them. 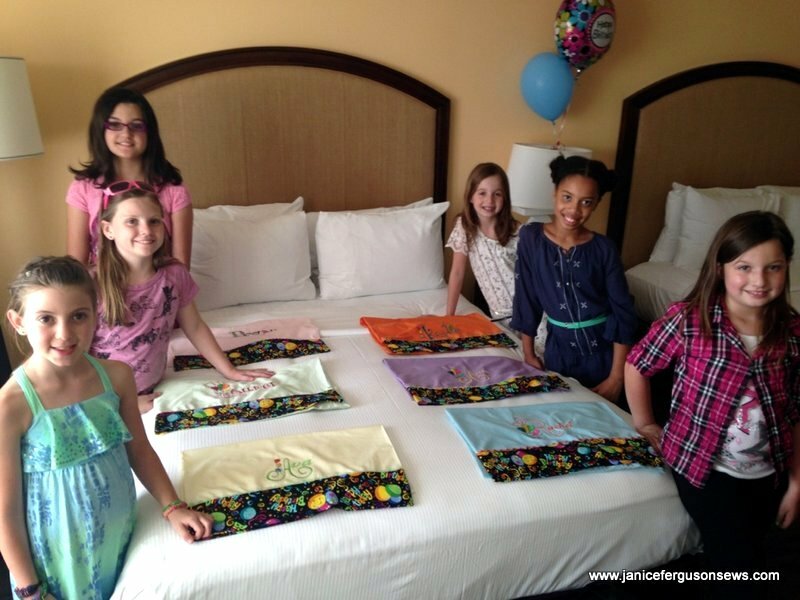 from SewForum: The pillowcases look to be a big hit for the girls and the party must have been fabulous for Laurel. I’m thinking her birthday cake is about the most scrumptious one I’ve seen in a looooooong time! Interesting that you had the puckering problem so now I feel like I’m in very good company. A few years ago I too, made several personalized pillowcases for some little friends of mine and like you, I was disappointed with all the puckering that was going on. I finally decided that they weren’t nearly as judgmental as I was and was pleased that they loved them so much. If you ever find the perfect answer, I’ll be happy to hear them. Love your “favors”! What a fun little project for you and I am sure the girls enjoy them. Love how you personalized each one, no two the same. Good job Grandma! I always enjoy seeing your beautiful creations. Shirley, this very minute I am embroidering with Floriani’s Wet N Gone. 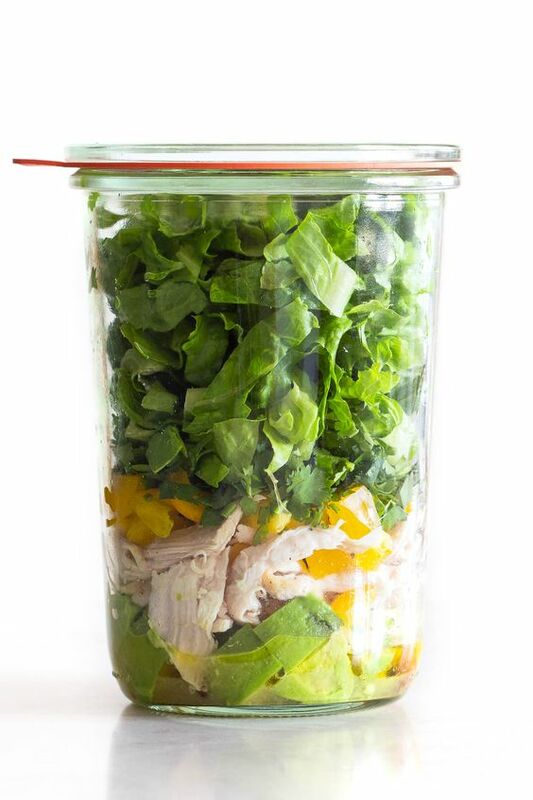 I’ve just started but will let you know how it works. Most of my problems are with synthetic fabrics. Thanks, Doreen. I always prefer to make no two alike when making several of the same item. 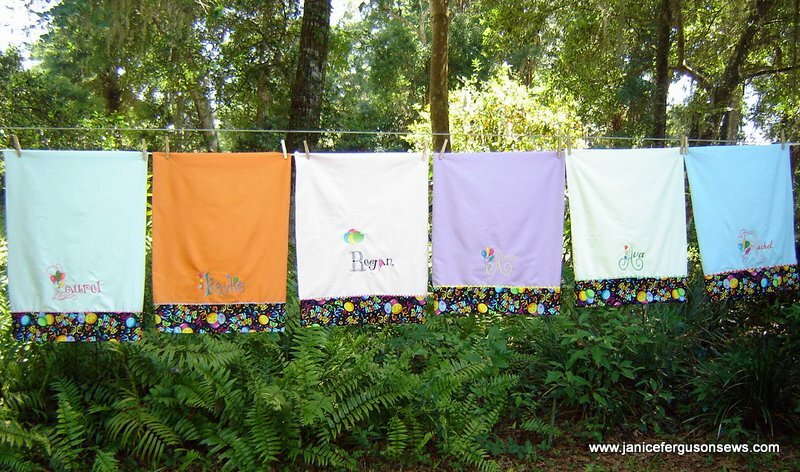 So many designs–sew little time! 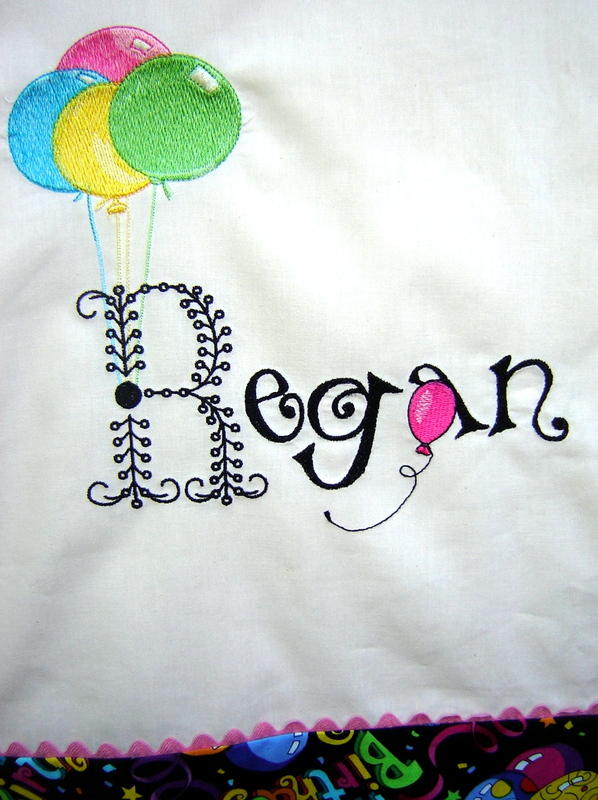 Where did you find the balloon embroidery designs. I think those need to be in my “stash”. Can’t you ALWAYS use balloons? 🙂 I have a plethora of fonts BUT always want more. Love the Loralie’s Loralesque! 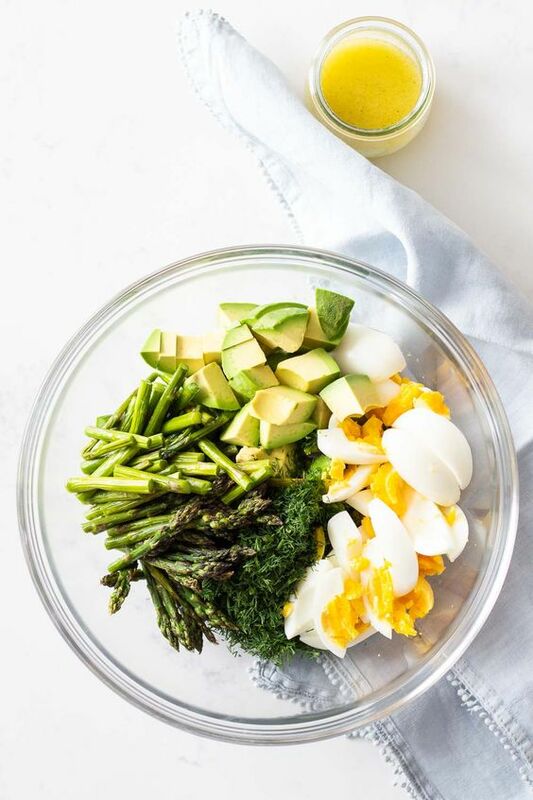 Diana, you are absolutely right–you CAN always use balloons! One bunch was extracted from a design in Babylock’s Horatio’s Birthday party. Another was from an old Amazing Designs collection, Birthday Party. I can’t find where the others were from. Why, oh why do I not make notes about the designs I gumbo together? I hope these are enough to get you started. I love the pillowcase party favors. Do you sell them? I need 12 for this Saturday. Let me know. Thanks so much!! Marie, I’m flattered that you would like me to make pillowcases for you. But I am swamped with projects for my grandchildren and don’t sew for others. I hope you find someone to do these for you.